What Causes Mould in a Bathroom? Did you know that there are thousands of mould strains? Mould spots can be black, green, white, orange, and other unsightly colours. They can smell very foul and cause allergic reactions or asthma attacks, headaches, dizziness, nausea, skin rashes, and even more serious health complications. Toxic mould often appears black and can be so dangerous to your health that you may need to move out of your home temporarily or permanently to prevent illness. 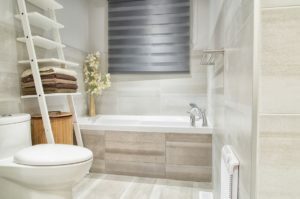 Since areas like the bathroom are prime spots for mould to grow, it is important to understand what causes bathroom mould. Here are some of the most common causes of mould, and how you can get quick and effective mould removal to get your home back to normal. If the weather has been humid for a few days, the humidity in your home could also rise. Humid environments are where mould grow, especially if the area is not well ventilated. Humidity troubles can also occur when your household HVAC system artificially heats or cools the air. Some mould needs only 55% humidity to grow, so keeping your humidifiers below this level can prevent this problem. Leaving wet clothes or towels on the floor or hung up in a poorly ventilated space can increase moisture in the area and lead to mould growth. Damp clothes left in a pile for over a day can end up fostering mould as well, which can spread once the spores reach the air. Another common cause of mould are leaky pipes. The worst leaks are those that go undetected, because they allow water to pool and remain stagnant for a long time. By the time you discover these leaks, mould may have already begun to grow. Pockets of stagnant moist air from a poorly ventilated area is the perfect environment for mould to grow. Steam and evaporating water create humidity inside, so to avoid mould from growing in your bathroom, keep the windows open after you shower, or turn on the ventilation system to ensure the moisture is dried up. Condensation is another culprit that can cause mould growth. When cold pipes and surfaces build up condensation, the moisture is a good environment for mould. You can prevent mould growth by checking for condensation in your bathroom. After you shower, wipe off the tiles or glass door with a cloth to prevent water from remaining on the surfaces. Soap, grease, dirt, and hair can lead to a clogged or backed up shower drain. The longer this blockage remains, the longer the area stays wet since water cannot go completely down the drain efficiently enough. The composition of the blockage is an inviting space for mould to grow. In some cases, the first sight of mould is not necessarily the only area mould has begun to grow. Moisture can come from hidden sources, such as a pipe behind the drywall or cracks in the tile grouts. As the dark areas maintain their dampness, mould spores can try to make their home there. Since you cannot see these areas of mould growth until they’ve already done their damage, professional mould removal services will be your best option. Bathroom tiles in your shower are constantly exposed to water and moisture. Over time, the grout in between the tiles can begin to wear down and deteriorate, to prevent cracks and chips in the tiles. If grout is not properly maintained and cleaned, it can wear down, attract mould, and look dirty and stained. Enjoying a warm bath or taking a long shower can be soothing and relaxing, but it is important to be very careful not to spill too much water on the ground, or clean it up carefully. Water that sits in damp, humid areas like the bathroom are a great place for mould to grow. Wet floors should be mopped up and the area should be well ventilated to eliminate the excess moisture. If you’ve spotted mould growing in your bathroom, you may want to spring into action and clean it yourself. Unfortunately, mould is notorious for getting into cracks and areas you cannot reach or see. To fully ensure there is no more mould in your bathroom, you should consult with a professional water damage restoration team. Cleaning mould on your own may seem like the most cost-effective and quick solution, but mould will return if it is not removed properly. Professional teams have the tools and experience to target all of the areas that could have been affected by mould, to ensure they can clean and remove all of it. If you need quick mould detection and removal, Flood Services Canada can help you. Our professionals offer a variety of services and solutions to problems related to water damage, and we can help you settle with your insurance company to save you money. We deploy our quick-response teams to cities across the Greater Toronto Area to help homeowners save their home in emergency situations. We provide sewage, water damage, and food cleanup services, and will use the best techniques, personnel, and equipment to ensure your home is clean, safe, and dry as soon as possible. Contact us at (416) 302-2107 to learn more about our services, or use our emergency hotline at (416) 999-3930 to get our rapid-response teams deployed to your location.